When you’re sealing a deal as an estate agent, the last thing you want is for a prospective tenant to take an age responding to your emails or letters; it keeps both you and the landlord or property owner waiting, and increases the odds of one of the parties backing out. What you need is an efficient, easy to respond to method for staying in contact; which is precisely what our SMS messaging service offers. However, this is just the tip of the iceberg as far as the mobile messaging service that we offer for the property sector at Textlocal goes; it’s ideal for sending information about newly available properties to large, custom made lists of interested parties, or automatically informing tenants of house viewings. Estate and lettings agents all over the country are already benefitting from text message communications, and you could be one of them. See for yourself how remarkably effective SMS can be while saving time and money on unnecessary phone calls, letters and emails. Confirm times of upcoming viewings and ensure prompt attendance with a quick text message at the time of booking. Send your potential buyers or tenants notifications when new properties matching their requirements come on to the market. Attach documents to text messages in a short, trackable link. This could be property details, application forms or confirmation letters. Chase up late payments with a reminder text to prompt action or remind tenants that their rent is due over the next few days to avoid delays in payment. Use a keyword on a short code for people to text in to receive information about a certain property or area. This could be on a for sale sign outside of a property. Have potential customers register their interest and give you their requirements with a mobile optimised data capture form, sent out as a link in a text message. Use the free Messenger app to send and receive text messages with your customers and tenants, great if you’re in between appointments and viewings. 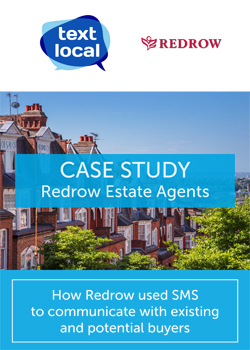 Download our latest property case study from Redrow estate agents. Text messaging works so well for us, we recently sent a text message to a group of people and a deposit was put down on a property within two hours.